They’re both pig farmers. They’re both Iowans. And, they’re last names start with the letter C. Those are just a few of the similarities between the central Iowa family of James and Jennifer Carlson of Gowrie and the Jim and Elaine Campbell family of Hedrick, which is located in southeast Iowa. The other thing they have in common? They were both recognized as Wergin Good Farm Neighbors this fall. 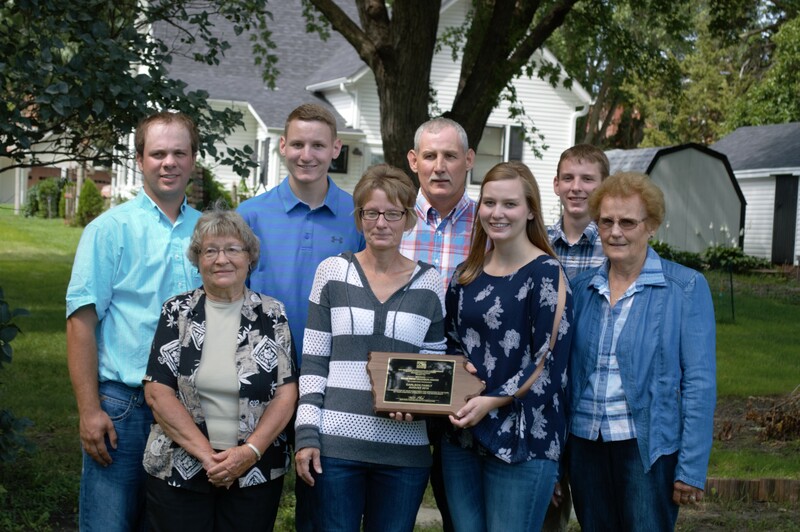 The Wergin Good Farm Neighbor Award recognizes Iowa livestock farmers who take pride in doing things right. This includes caring for the environment and their livestock and being good neighbors. It is named in memory of Gary Wergin, a long-time WHO Radio farm broadcaster who helped create the award. It is presented by the Iowa Department of Agriculture and Land Stewardship and the Iowa Ag Radio Network. James and Jennifer Carlson, along with two of their three children, raise pigs and cattle on their farm, in addition to growing corn and soybeans. The Carlson family of Gowrie. “Livestock production is so important to our state and rural communities and it is a great honor for me to help recognize the Carlson;” said Iowa Secretary of Agriculture Mike Naig when he made the award to the extended family at an event in Gowrie which was attended by more than 100 friends, family members and ag service representatives. Additionally, Hubbard said, “They have very neat facilities that are well maintained, and the whole family is involved with farming. The family has a state-of-the art finishing buildings, which they planned for with help for the Coalition to Support Iowa Farmers (CSIF). The Campbell Family of Hedrick. Jim and Elaine Campbell have a 2400-head finishing unit, and also raise corn and soybeans. In addition, they are Pioneer seed dealers. Their friend Kurt Lowenberg provides management and labor for the pigs. “Congratulations to the Campbells, another deserving farm family that does a great job caring for their animals, protecting the environment and serving their community. They are a family that is always looking for ways to do an even better job on their farm, including installing solar panels to reduce their environmental impact,” Naig said. The family installed solar panels on their swine building to help meet their electrical needs. Jim is Pork Quality Assurance (PQA) Plus certified in order to provide the best possible care for his animal while also protecting food safety and public health. 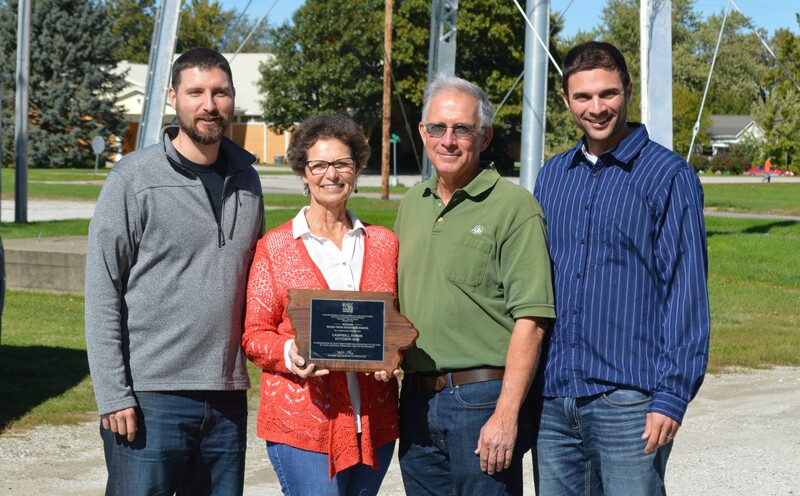 The family was nominated for the award by Greg Brenneman who knows the family through his work with ISU Extension. Brenneman highlighted the family’s commitment to environmental stewardship, animal husbandry and community involvement in his nomination. Jim noted that he relied heavily on Extension to guide him through nutrient management decisions. “Greg was instrumental in helping us manage that while staying economically viable,” he said. As Elaine thanked those who gathered at the Hedrick Community Center, she noted “Everybody in this room is a good neighbor. Your integrity makes this a wonderful place to live. Jim has served on the Southeast Iowa Ag Research Association (SEIARA) board, including a term as board president. He was active while the association was raising funds to acquire additional land for ag research by Iowa State University.